No, Chicken Little, the sky is not falling. It has just shifted from clouds skittering past to a more mellow and peaceful sky. Every day, we hear news about the cooling real estate market but it’s important to consider all the factors that go into those reports. 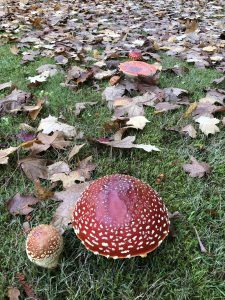 Yes, our market has chilled slightly from its previously overheated state (although we never reached the same sizzle as the Seattle market) and has settled into what might be described as a strong normal market. The business section also contains reports of ongoing job growth in the Seattle area, especially in the well-paid tech industries. 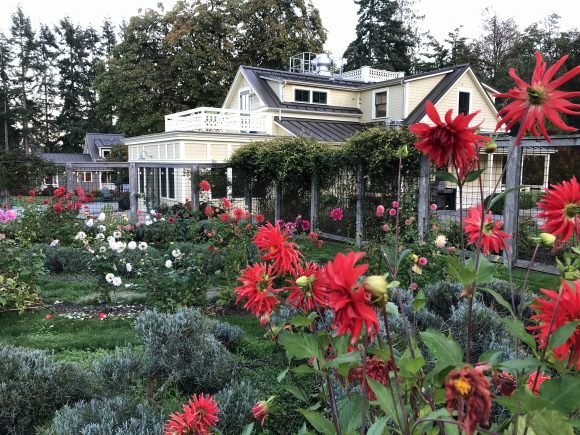 Concurrently, when Seattle’s transportation woes and other urban issues are taken into consideration, the demand for Bainbridge homes, especially for families, will likely continue for the foreseeable future. On the whole, most indexes show data that support a steady market in the coming months. If we isolate the third quarter and look at sales, the number of homes sold only dropped 4.4% from 2017 (137 in 2017 and 131 in 2018). In that same period of time, the median price of homes sold actually went up from $875K to $912K – a 4.2% increase. If we compare the median price of homes sold during the third quarter, they are up 8.8% from the beginning of the year. Additionally, the Cumulative Days on Market (the average time it takes to sell a home) dropped in the third quarter of this year compared to 2017 (44 in 2018 vs. 47 in 2017). The inventory and pending numbers are where elements of the cooldown show themselves. Inventory is actually down in both total inventory and active (total less pending sales), which is contrary to what people are hearing. Pending sales (homes under contract) are weaker at 40 compared to 57 at the same time last year. Of all the numbers we examine, this 29.8% drop is the one that most directly supports the slowdown assessment. That being said, when we look at all the data at once, we can conclude that the market is pretty darn healthy and strong. 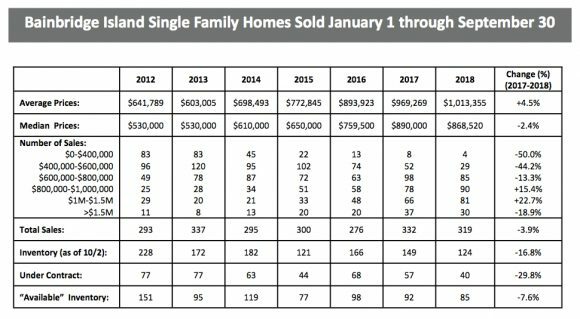 Maybe not as feverish as last year, but it’s still a great time to be selling or buying on Bainbridge Island. The condominium market has softened compared to 2017, with 73 units sold compared to last year’s 89. There seem to be two parts to the condo market: the affordable (less than $500K) and the higher end, which usually includes a good view. The affordable is actually up from last year, with 64 sold versus 45 in 2017. The drop in this segment’s higher end appears attributable to a lack of supply rather than a softness in the market. Land is also lagging a bit behind 2017. We’ve had 24 sales so far this year compared to 29 in 2017. Buying land with the intention of building is not for the faint of heart these days. Good builders are busy and in short supply and construction prices are still rising. The new zoning rules have also added an element of uncertainty. It is true that we’re not seeing as many multiple offers as we did last year. Prices have risen but not at the frenzied pace of last year (over 18% from the beginning of 2017 to the end of the 2018 third quarter). Our rental market has also calmed down. 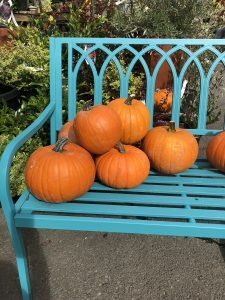 Business in our Kitsap County neighbors, Kingston and Poulsbo, is also feeling healthy and strong and they are also benefiting from Seattle’s growth. Buyers do not seem to be particularly concerned with rising interest rates (which, after all, are still quite low), which helps boost their confidence. As we enter the fourth quarter, there are many opportunities for both buyers and sellers. Sellers benefit from the lower inventory (which means less competition) and the typically slower pace of the end-of-the-year market makes sellers view serious buyers with more attention because there simply aren’t as many buyers shopping this time of year. Whenever the market shifts, it’s wise to ensure your strategies have adapted to it. As we tilt toward normalcy, there will be more competition for buyers that sellers need to accommodate. Presentation, realistic pricing and sound advice when offers do arrive are as important as ever. Skillful real estate brokers prove their value in helping both buyers and sellers match their approaches to the existing market. We here for you, wherever you are in your real estate journey. All in all, life and real estate are good on the island we call home. We wish you health and happiness as we head into the holiday season.